Say April Fools' with five OpenOffice.org pranks. Open source has a sense of humor too! Pick someone who isn't your boss, and it's best not to pick anyone under pressure such as that of a tight schedule on a big project. 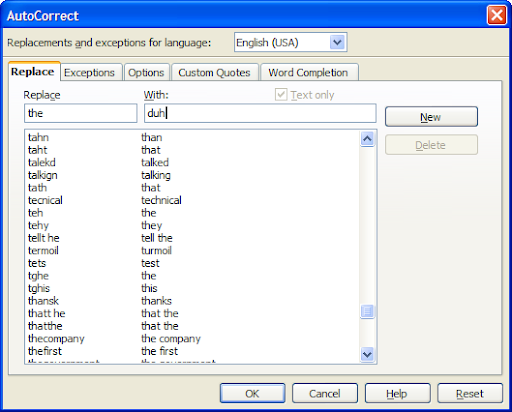 In the Replace field type a common word spelled correctly. In the With field write a subtle typo or obvious blooper. Why Why do birds suddenly appear every time you are near? When the fun is over, click on the new entries and delete them. This article was inspired by Amy Bennett's "5 DIY pranks for the enterprising geek". Make the Writer menu bar disappear. Close OpenOffice.org completely (including the quickstarter, if it is running). On Windowss, open up the folder c:\Program Files\OpenOffice.org 3\Basis\share\config\soffice.cfg\modules\swriter. On Linux, look in /opt/openoffice.org/basis3.0/share/config/soffice.cfg/modules/swriter/menubar/. Tip: To modify Calc instead of Writer, substitute scalc for swriter. Tip: The path varies for OpenOffice.org version 2 and on many Linux systems, so if you can't find it, do file search for swriter. Rename the file menubar.xml to menubar.xml.bak. Start OpenOffice.org back up (if it was already started, so as not to arouse suspicion prematurely). When the fun is over, rename the file to the original name. Thanks to Mr. Excel for this idea. Strike fear into the hearts of your colleagues when they start OpenOffice.org to find Microsoft Office branding: just switch out the splash screen. Sure, who doesn't love ponies. In fact, ponies are so great that every time the victim presses the left arrow, it will conveniently open up his favourite web page www.ILovePonies.com. What a time saver! This prank is trickier to implement, so practice on your own system and give yourself extra time. Click Tools - Macros - Organize Macros - OpenOffice.org Basic. Delete the line of code (starting with "Shell") not applicable to your operating system. Click on the shortcut key you want to change. I suggest Left. Under Category, click OpenOffice.org Macros to open it up. Open the "folders" user, Standard, and Module1. When nobody is laughing anymore, go back to Tools - Customize and click the Reset button. Thanks to Hildreth for the idea and to DannyB for a way to do it in OpenOffice.org. If you prefer the 1987 musical stylings and energetic dance performance of Internet meme star Rick Astley, replace the ponies URL in the above joke with the URL http://www.youtube.com/watch?v=oHg5SJYRHA0 for a Rickroll. Don't forget to turn the speakers up so everyone can enjoy! Share your favourite, work-safe April Fool's Pranks in the comments. Be sure to credit the source (preferably by name and URL). thank you for those inspiring ideas ! it really got me do something useful for our school's OpenOffice install base. i changed the "I Love Ponies" idea and used it to invoke a menu action instead of a keyboard accelerator. i added a new menu item (on the Help menu) that opens up the Hebrew online wiki book (it is a tutorial and a help book). so students and teacher can get the latest Help in their own language directly from the Help menu. NOOOO! Not the RESET buttons!! April Fool = Unintended Consequences. As if the only changes are made by pranksters. And as if the IT or user backups got the profile right. OTH, this may a rare opportunity to get many folks to see that they CAN make changes, so maybe I'll call back my Tar and Feather party. And if no one says, "Just Load the keyboard settings that have been Saved," I won't mention the Toolbar and Menu Reset buttons which oddly have no Save features that I have found. I did a similar thing with Microsoft Word many years ago. I had a boss who was a total jerk, so I set up autocorrect on his machine to replace "Sincerely" with "I'm a Nazi pig f**ker. Unfortunately, I don't think he ever wrote a letter and signed it "Sincerely" after that, because I never heard anything about it. Pity. Ever heard of a bound book of the internet? Check out J. Peterman's foolish items "for sale" today!